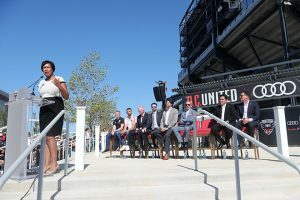 The D.C United Continued their summer to opening Audi Field today with one more step toward the grand opening on Saturday night against the Vancouver Whitecaps. The ribbon cutting ceremony was held this afternoon where officials from the club along with D.C Mayor Muriel Bowser as they officially begun the week of opening which will also include as follows below. Pay close attention to D.C. United social media at 10 AM for your chance to win the first pair of tickets to the inaugural match at Audi Field! The final pair of tickets will be given away, as well as D.C. United swag before the big game on Saturday. Audi Field’s brand new fan plaza opens at 4 PM and is your place to party before kickoff featuring a live concert by White Ford Bronco! Photo mosaic – stop by to take a picture using #UnitedAtHome to be added to the fan mosaic, a photo time capsule that will be hung permanently at Audi Field. Opening of the brand new Club Shop, one of the largest in MLS, opening at 4 PM.